My husband accepted a new job in our home state of North Dakota! We are more than glad to back in Bison Country. However, moving across the country with littles, quitting our jobs and me trying to find a new one all while pregnant.... I haven't had much time for social media. So I will just JUMP right in! I had been trying to find a way to capture the very most of the year with a title page - This year I nailed it square on the head! :) I came up with what I consider my best PL idea yet! I decided I wanted to include a bit of each month - sort of an index page for the entire year - a little preview of what you could expect in the many pages to follow. I used the season mini kit for the entire album because it worked for me! As you can see on the front I am adding a single image for each month (perhaps my favorite photo from the month or one that shouts excitement) and on the back I included several of the months (for sure the months with birthdays, anniversaries, and other important dates in our family) and each season to include other important info about what our family did during this exciting year. My goal is to add to this every month to stay caught up and to create an exciting place to look back on our journey in 2015! *Make sure to look back at the end of the year to see this project completed! January came with some pretty exciting news in our household! We are having a baby! We couldn't be more thrilled to be having baby # 3. Our boys were also very excited.... However, our 2 year old thinks he would rather have a puppy while our 4 year old argues a baby is much better! Blush Core Kit, Coral Core Kit, and the Be Bright specialty themed cards. In February I got a NEW CAR! I had wanted a Buick Enclave for a long time - They are such a smooth drive! We were thrilled to have enough room in the car for our new addition when the time came! We named our new car Belle - Living in the south, we found it fitting! (anyone else name their vehicles?) We also got 4" of snow! The kids had a blast playing in the wet snow! At the end of February I became an aunt to my first nephew! It will be fun for the boys to have a boy cousin! Dazzle Edition Mini Kit, Be Bright Specialty themed cards, and the golden themed cards. In March my hubby interviewed and accepted a new job back home! We were thrilled, however, it was an emotional time. We had to say goodbye to our home and the few friends that became family in our short 2 years in LA. The process was very quick. Within a few weeks, my hubby flew home to interview, accepted, and started his new career. The boys went to stay with family and I was left alone for just over a week to tidy things up and make the last of our LA memories. 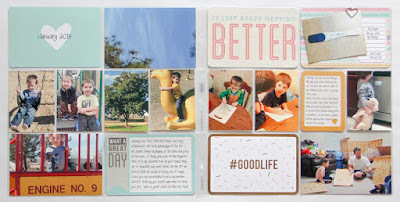 Be Bright Specialty themed cards, Dazzle Mini Kit and Blush Edition Core kit. April was a month of unpacking! Oh and compared to LA, it was COLD and WINDY! Nonetheless, we found the park on nice days and enjoyed time together as a family. Easter was the first holiday in 2 years that we spent with extended family. At the end of April we learned that we would be welcoming another little boy into the world! I officially became a mom of boys! I used pocket pages A and the ready set go value kit. The chip board is also from this set. In May our life finally slowed down! We were out of town a few of the weekends for graduations and business, but we got to enjoy being together and loving on our kids for a majority of the time. Oh and I became an aunt again! To the sweetest little girl! I used pocket pages S and U and the Honey Edition Core Kit. our random month of May. June was another busy month! I applied for a job and within a week and a half I accepted and started my new position! For the last 4 years I have been an xray and CT technologist. I now wear the hat of MRI technologist. MRI is much different but I am enjoying the new challenge and CLINIC hours! With having weekends off - we have had the opportunity to spend time with family and even got to the lake! I used pocket pages Q and N. I used DAD themed cards for the entire layout! I hope you have enjoyed the first half of the year. I have enjoyed documenting with Project Life and staying up to date each month! Because it truly is that EASY. 100 Things We ARE Doing This SUMMER! Put both of those things together and you get a whole season filled with many adventures and memories to last a lifetime. This summer I decided to enjoy our summer to the MAX; At the beginning of the summer we made a list of 100 things that we WILL accomplish (or at least try to) before the summer is over. After all nothing would make the summer better than having FUN together! Together with my Big Boy and pinterest (& google of course), we came up with a foolproof list of things that would make this summer the BEST SUMMER EVER! Make sure you check out my pinterest inspiration board - 100 Things To DO This Summer 2015. 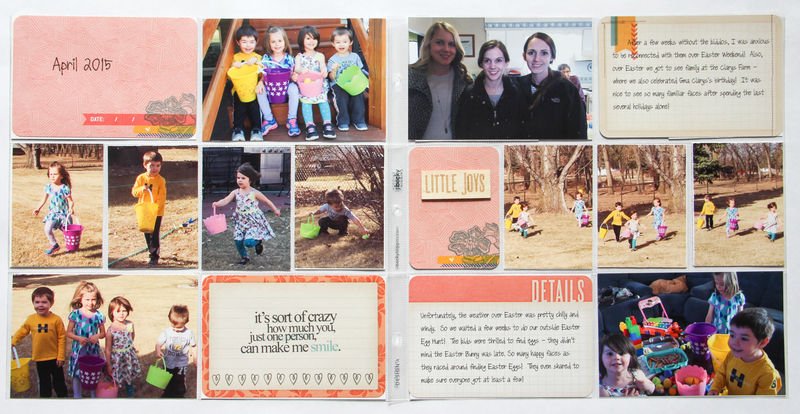 To document our summer fun - I am using a Becky Higgins 6x8 leather album! Stop back to see updates on the blog! In 2014 I started using Project Life to document my everyday! Project Life has made documenting everyday life quick and fun! 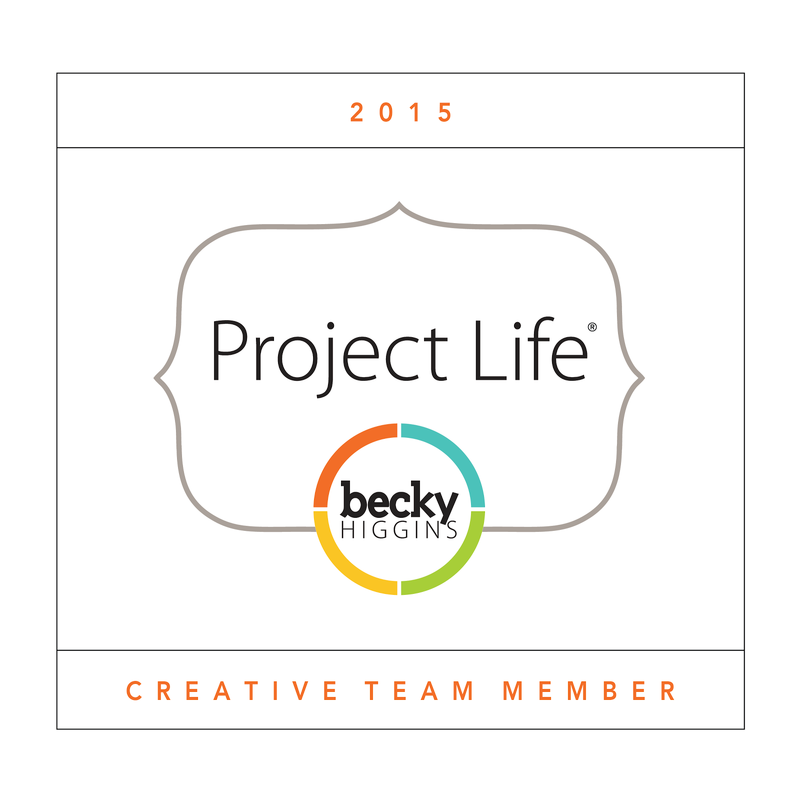 As you know in December I was selected to be apart of the 2015 Project Life Creative Team! Before applying for this opportunity I shared project life with my closest friends and family! I had started this blog a while back with intentions of sharing random joys in my life and in hopes of finding a community out there where people shared the same passions and interests that I do - This year has been a complete blessing! I have started following several blogs and have learned from many normal yet very inspirational women! The 2015 creative team is great and I already am beginning to feel like I have made several wonderful friends that share a passion for everyday life! This is my very first post to share my Project Life album and style. 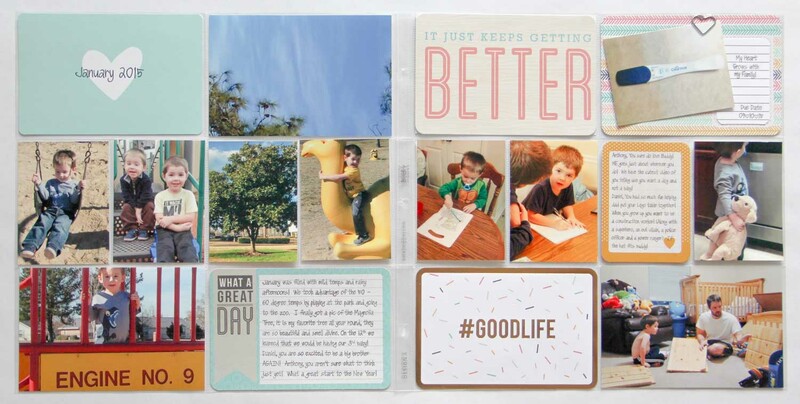 Project Life is great because the cards are so dang cute, so even if you don't have a lot of time or interest in adding a lot of embellishments or stickers - your pages are adorable! I hope you Enjoy a few my favorite spreads from 2014. Edition Core Kit. This Core Kit fit nicely with the spring colors! The layout above is from one of my single most favorite days in March 2014. The weather was absolutely perfect (70s and sunny), I spent the day with one of my Best Friends in Natchitoches, LA touring the plantation homes, Magnolia and Oakland! We enjoyed the history and culture preserved in this tiny little town! 'This Day' Set is yours free!) **Pocket Pages also by Stampin Up. 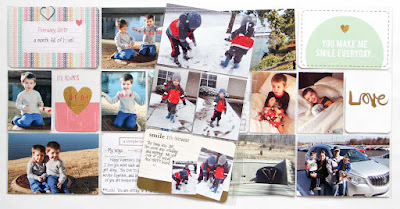 April 2014 - was filled with fun in our home this year - the boys had been pretty sick with strep throat, tummy bugs, and ear infections from thanksgiving through the end of January! So I went a little overboard at Easter! At the end of April we traveled to Jackson, MS and visited the Mississippi Children's Museum! If you are ever near Jackson - this place is definitely worth stopping! We loved it so much we hope to go back this spring! and journal cards! They are the BEST! August 2014 - we celebrated Daniel's 4th Birthday! Where does the time go. Our children spent a large part of the summer up North visiting their grandparents so we were more than thrilled to love on our kids each day doing the normal things - like going to the park and playing in the backyard! Pocket Pages A, Insert Page H. I used PL cards from Baby Edition. September 2014 - We visited Gulfport, MS and spent just 1 day on the beach! It was my first time to the ocean as well as the first time for the boys! We had a blast! The beach was nice and secluded! October 2014 was one of the best months of the year! The kids and I drove up north to spend some time with my family before the weather got terrible! Even though I was sick most of the trip it was still nice to see so many familiar faces! PS most of these photos were taken at pumpkin patches in both ND and LA! It sure is fun to play in a seasonal area! 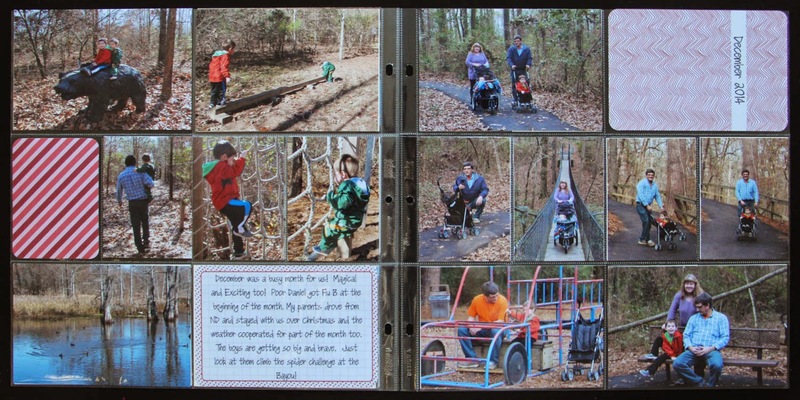 November 2014 rained A LOT so the kids and I stayed inside A LOT. ON a random day in the middle of November it was 70 and sunny so the kids and I decided to travel to Lincoln Parish Park to have a picnic and enjoy the beautiful day! I love all of the changing colors and this is seriously a pretty park! Pocket Pages A. PL cards from seasons mini kit. Thankfully our weather in December 2014 was fairly nice and allowed us to spend some quality time outside over christmas! My parents drove down to spend the holiday with us and we were thrilled to show them some of our favorite places to play. It isn't difficult to see that I do not use much to decorate my layouts! I love the way they look just by journaling on the cards and inserting my favorite pictures from each month! 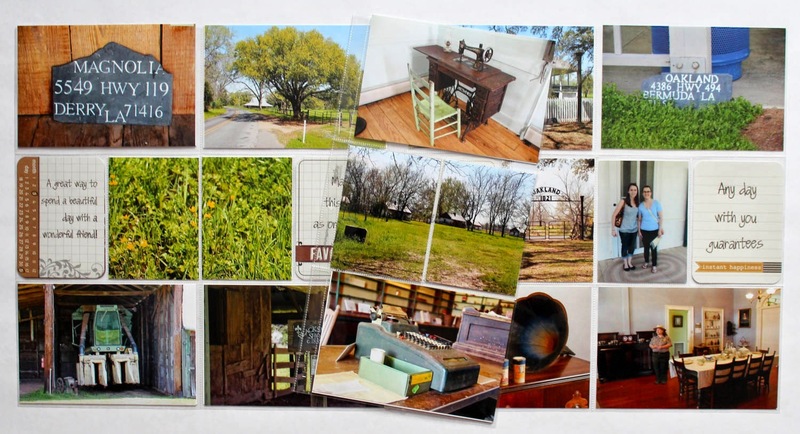 One of my favorite things about project life is that my 4 year old gets excited to help pick out the photos that we will be using. And both of my boys love to look through the books over and over. It is so much fun to see and hear how excited they are that they have books about them!! If you are new to project life and want more information on how to get started visit Becky's Website! All the info is there! I promise it is so easy and so much fun! A few days ago while I was getting lost in social media, I came across a blog post about using everyday art by our kiddos as a necklace and even more as a special gift. Another one of those gifts I love oh so much that MEANS a little extra special something! While reading this inspiring blog post - a few ideas were running through my head. I was even making a physical list of items I would need to buy and searching for this special paper on Amazon - because before reading this post I had never heard of shrink paper.... Really. Check out the post that inspired me here! She also has lots of other really fun things. I purchased it early enough in the morning that I got the paper the very next day! I got all ready to print on my Shrinky Dinks paper and read the instructions. THIS FILM IS NOT INK JET PRINTABLE. **So if you plan to use an inkjet printer to apply your design to the shrink paper - make sure you buy the right one! Best part, when we got home everything was ready to print. I printed my design, cut them out, rounded the edges, (my design measured 1 5/8 x 2 1/4 inch) punched a hole and put them between two pieces of parchment paper on a baking sheet and in the oven at 300 degrees for a minute or two while keeping a close eye on them. Each time I tried the paper curled to no repair. I made several attempts to straighten them out, each time was unsuccessful. I followed the directions on the package perfectly, I googled several tips and was still unsuccessful. I decided to just start OVER! I took like a 2 second break, got the kids a snack and printed my design on my second piece of Shrinky Dinks Inkjet paper. This time I used a paper cutter and a corner punch to trim the edges of my charms. Lastly, I punched my holes with a regular hole punch and again they were ready to heat! I preheated the oven to 275 degrees. I used the same parchment paper I did the first time. One piece on bottom and one on top of my design on a baking sheet. I decided this time I would let the design bake for 3 minutes before I tried to straighten it out. The directions said that it may curl and to help straighten it out if it does. To my surprise when I opened the oven at the end of 3 minutes, my design was mostly flat - so I quickly removed the the parchment paper and charm and flattened it under a heavy box. Left it there for about 15 seconds and it was perfectly flat! I placed each piece in the oven separately to ensure this was going to work this time. And it worked great for all 15 pieces! My Final project measured 1" x 3/4". I inserted the jump ring and attached 3 charms to a split ring and there ya have it, my new super cute charms! There may be a few of you that can recognize these little charms! 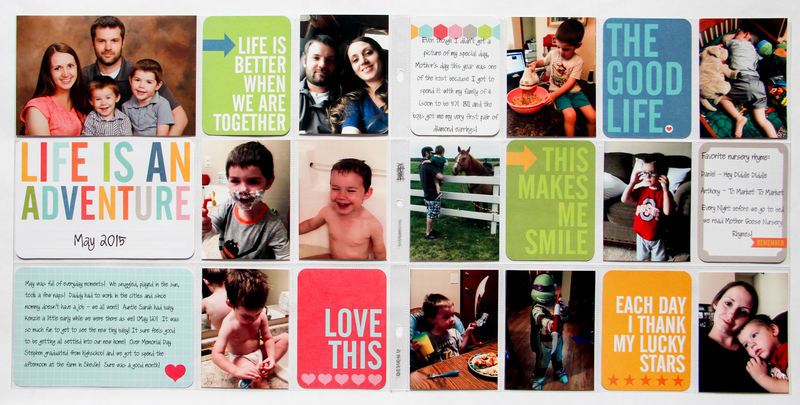 They are a few of the Project Life cards that are truly meaningful to me! I felt that these cute little charms would be a great addition to my work badge - a little something to inspire me while working long hours in the ER! I really do enjoy my new charms! They sure do add a little something something! Hooray! Happy New Year! We joyfully welcome 2015 with a new exciting journal! This year I will be keeping journals WITH my boys. I now have a 4 year old - one that LOVES to LEARN! He is fascinated with writing his name and other words - He asks how to spell just about everything. (something silly or something sweet or even an altercation if that is what the day holds) Or maybe I will include a photo or a project we have done. If nothing else, EVERY DAY my 4 year old will write his name (maybe more). And together, we will watch the progress over the year! **Writing things down has been the best thing that I ever did!! BECAUSE with this new role, and being a full time student, having a part time job and living hundreds of miles from any family, time became scarce and my love for scrapping was more of a weekend thing while the baby was napping, oh and after I had finished all of my studying if I wasn't working. :S Needless to say, I had gotten WAY behind. But I continued to write things down and print lots of pictures on Shutterfly, Snapfish and Winkflash. I'd order pictures from 3 different websites to catch the best deals and penny print sales. Then in 2014 MY LIFE CHANGED! I discovered Project Life. I found beckyhiggins.com and I was instantly HOOKED. 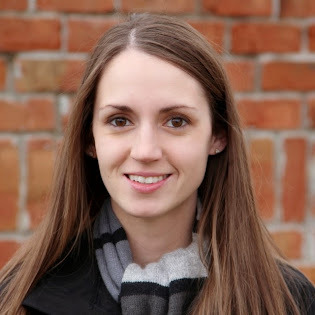 I watched her videos and read her blog and started following several other blogs, I had already loved several of her designers and each one of them promised how simple it is to create beautiful pages in just minutes. I didn't waste anytime I purchased my first core kits and several mini kits and page protectors and I got started. I was ALL IN. In less than a few weeks I had several pages done and in a book and on the shelf. The kids and I had paged through them at least a couple dozen times reliving our memories together. The books that I make and set on the shelf are truly favored by both of the boys and my husband... and myself! In October I saw Becky's blog post - 2015 creative team call. I read through it like 5 times and finally chose 3 of my recent layouts and took photos of them and sent them in along with a little snippet of information about myself. What a dream come true - about 6 weeks later I got THE email from Becky, before I could even get through the first paragraph, I printed the email (probably to make sure I wasn't dreaming) and took it to the living room and read it aloud for all to hear. I figured it was one of those emails.... that the whole family would get excited about. I CANNOT stop SMILING! I joyfully welcome 2015 and am anxiously waiting to start this new adventure along with 2 dozen other women from all over the world, that share a love for colorful paper, photography, and documenting. 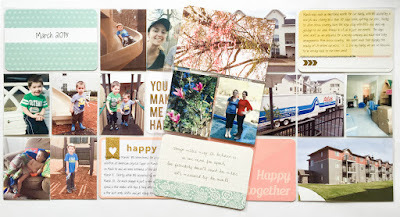 Check out the 2015 Project Life Creative team here. I am very thankful for this opportunity and am loving all of the positive energy that project life has brought to my life. These ladies are positively sparkling. If you are new to Project Life check out the video below and the website to discover all there is to know and love about Project Life. This year I plan to keep up with Project Life on my blog. I hope to inspire you and I already have been inspired by so many many other project Lifers. Thanks for stopping by my positive corner on the web. My favorite scrapbooking accessories are definitely rub ons - I can still remember the very first time I ever used one! They look like they are apart of the paper - yet stand out like a sticker! 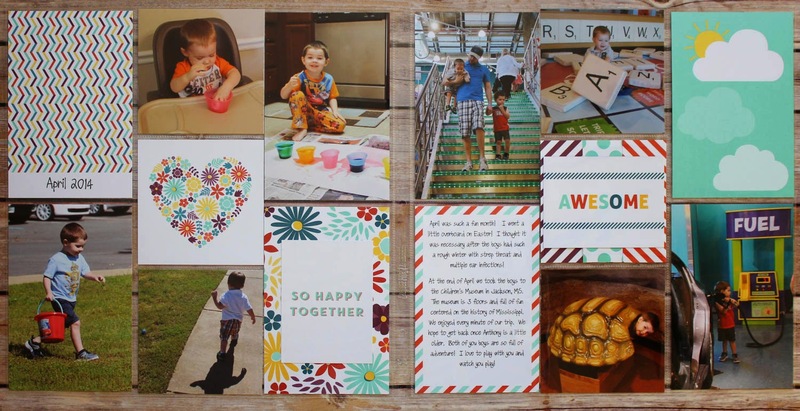 They instantly became my favorite thing to scrapbook with - however, 8 years ago - they were more difficult to find in stores than they are today! So with google - All things are possible, I found several tutorials to make my own! And over the last few years - I have perfected my own way to create Rub Ons that work on nearly anything! I usually just use rub ons for paper crafting - but recently have been using the same technique on WOOD! Take a look, it definitely works well! Recently, a dear friend of mine graduated from a nursing program and made her this little gift! -First I stained my bare wood and sanded the edges. -I typed my desired font in Microsoft word, and in printer properties I changed quality to high and mirrored my image. -Lastly I used a spray sealer several times to seal the plaque for years to come! I hope you found this helpful! Enjoy!